►► Click "ADD TO CART" to get yours now! FULLY ADJUSTABLE ANGLE, PERFECT FOR ANY MEDIUM - Paint, ink, charcoal drawing, sketching and more... prefer horizontal, vertical or anything between? This easel was built for you. Love to watercolor? We got you covered, simply adjust the easel to lay perfectly flat and enjoy painting without any puddling up! Love using oil paints? Simply set in the completely vertical position and never have dust settle on your painting during that long drying process again! 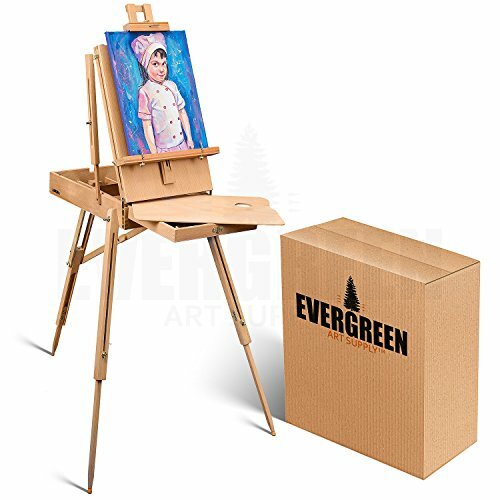 THE MOST VERSATILE ALL IN ONE EASEL, FOR ANYBODY, ANYWHERE - Adjusts to as high as 71" for people tall or small, holds canvas as large as 34". Angle of canvas adjusts anywhere from horizontal to vertical. Converts from a stand up floor easel to a compact desk top easel. Includes a stow away painters palette, plus a built-in sketch box. Works both indoors and plein air, stabilizes on uneven ground and has the portability of a briefcase! No matter what you're up to, this easel's got you covered. WE TAKE YOUR SATISFACTION SERIOUSLY - 100% THRILLED GUARANTEE! - What's the 100% Thrilled Guarantee? Simple. If you are not absolutely in LOVE and thrilled with your heavy duty, yet light weight pro collapsible easel, we will give you your money back. No questions asked, and no need to even return the product... no joking! ...what are you waiting for?! Click "Add to Cart" and get yours now! If you have any questions about this product by Evergreen Art Supply, contact us by completing and submitting the form below. If you are looking for a specif part number, please include it with your message.